As we have recently observed, summer dresses often lack pockets and belt loops. Fortunately, some guns are light enough that a belt thrown around the waistline can support a sufficient holster with comfort. This one, made by Simply Rugged in Arizona, works nicely for Kel-tec PMR30. This entry was posted in holster, pistol, self-defense, weapon and tagged 22WMR, dress, Kel-tec, leather, PMR30, woman. Bookmark the permalink. Or she might push down with her shooting hand thumb. If she’s planning on reaching across for her spare magazine I’d suggest it should face with bullets pointing to the rear. Both true comments. We tried and the pistol came out fine with a push of the thumb. Beautiful pics and a lovely woman as model. 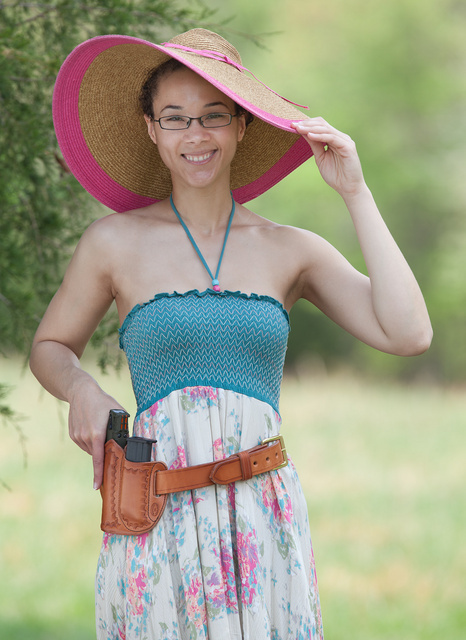 There are actually carry rigs that would hide a pistol, even with the warm weather dress, such as thigh holsters, but I think they’re somewhat problematic. I think that this is one of the few cases where a purse holster (with the purse worn cross-body with a cable-reinforced strap) would be called for. 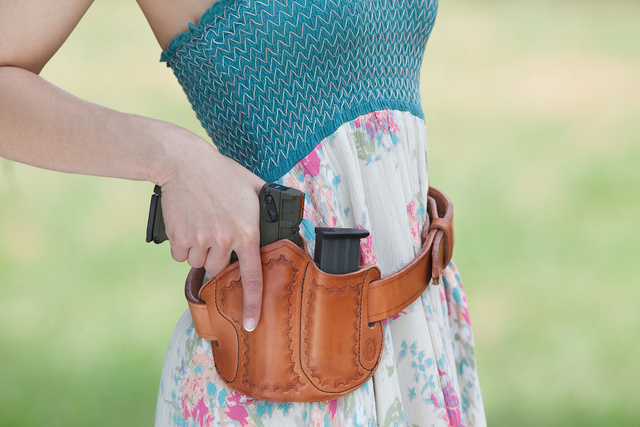 A PF-9 in a pocket holster would fit even a small purse and would not cause it to sag or look like it was carrying something heavy. Great work on the photos! 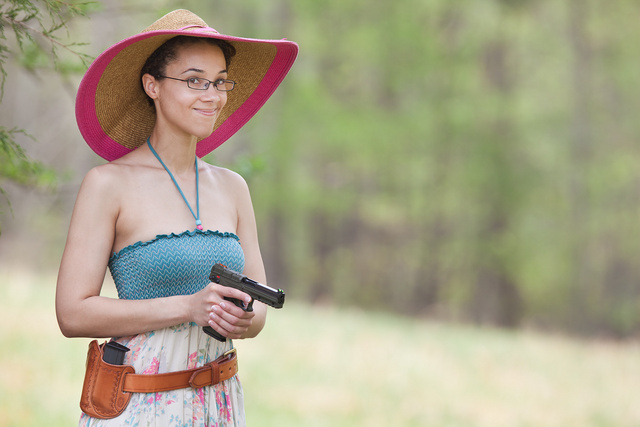 My wife has a t-shirt with the saying “An Armed Society is a Polite Society” , the depiction of a lady in a fancy dress, hat and holster and a gent kneeling in front of her. Your model could pull that off easily. Do you have a pointer to where that T-shirt is for sale? A pretty girl in a summer dress…thanks for the nice pictures! The beauty of the Keltec PMR 30 is that with only one spare magazine she now has 60 rounds. Though I can’t imagine a scenario where that many bullets would be needed, she has a practical redundancy should the first magazine. Also, just because I can’t imagine a scenario does not mean she should be limited.